← But what about ………? I am lucky to have seen massive improvements in my health in the last year, and it’s amazing to look back at my posts from a year ago and realise that although I was improving I was still significantly affected by ME. In February this year I wrote that I felt Recovered. Since then I have had a few instances where I haven’t felt 100%, but generally life, and my health, is pretty good. I’m training for my summer cycle challenge to cycle the Coast to Coast route, and I’m increasing my physical activity levels all the time with no Post Exertional Malaise (PEM) in sight. My 2014 May 12th post explains more about PEM and I’ve also written a PEM survival guide). Last week I cycled over 30 miles for the first time. This week I plan to start adding more hills into my rides. My day to day life is full. I spend a lot of time caring for my family and running our home. I still don’t have a paying job, but my life is full of activity. I take a regular pilates class, do yoga, go for walks and cycle rides, sing with a choir and I have been learning dressmaking, and of course I write this blog. Weekends are busy, both with kids activities and socialising. We spent the Bank holiday weekend visiting family. We took my 22 month old niece to a farm for the day, and we took my twin 5 year old nephews swimming. In addition we stayed up late chatting with grown ups in the family. Add in the travelling and less sleep than usual and I was pleased to feel fine on Tuesday. I do still sometimes feel a need to rest, but it’s not every day, or even most days. I can confidently plan to meet people or do things in advance now without having to worry about cancelling due to my symptoms. Mookpixie has written this great post which compares having ME to having a smartphone with poor battery life. If you want to understand a bit more about what it’s like to have ME I highly recommend it. I am one of the lucky ones. 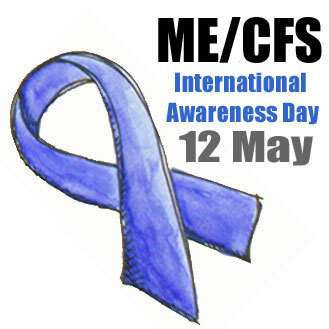 Many people with ME/CFS never fully recover and some are severely affected. I am in contact via facebook with the family of a young girl who when I first knew her was trying to start college. Her ME didn’t allow her to attend college enough and she had to drop out. Three years on her health has declined and she has been in hospital for the last several months, severely ill. I hope that she will improve with time, but research is desperately needed so that we can help people like her. I also follow the World of One Room on Facebook and have been saddened to read that after some recent improvements, including managing to leave her room, Jessica’s health has declined again, and she has also been very ill in hospital. Jessica wants people to spread her #smileforasmile campaign. Here are the instructions. It’s a lovely idea and I hope lots of people will join in with this simple activity. These are a few examples of the hundreds of thousands of people affected with ME in the UK. Everyone is affected differently, some with mild ME/CFS are able to work and socialise, but are still limited by their symptoms. Others are housebound or bed bound and may be very isolated by their illness. Today is about raising awareness of this terrible condition, but it is also a good opportunity to focus on raising money for ME charities. This year my husband and I are both fundraising for ME charities. I am doing my coast to coast cycle challenge, and raising money for Invest in ME. My husband is doing the C2C with me, but that’s not enough of a challenge for him. Instead his fundraising is focussed on doing two triathlons in a weekend. The triathlons involve a swim in a lake in Snowdonia, a cycle up a mountain pass (and down again) and a run up and down a disused quarry. After doing it once he then does it again the following day but twice as far.If you’d like to sponsor this mad endeavour go to his fundraising page. He’s raising money for Action for ME and Alzheimers Research. My lovely nutritionist has a new, improved website, and if you head over to her website Nutrition Within you can get some free healthy recipes. What a treat for reading to the end of this post. This entry was posted in my experience, recipes. Bookmark the permalink.